Mikiana can be written in more than one script. The Roman alphabet was not used until English became prevalent. 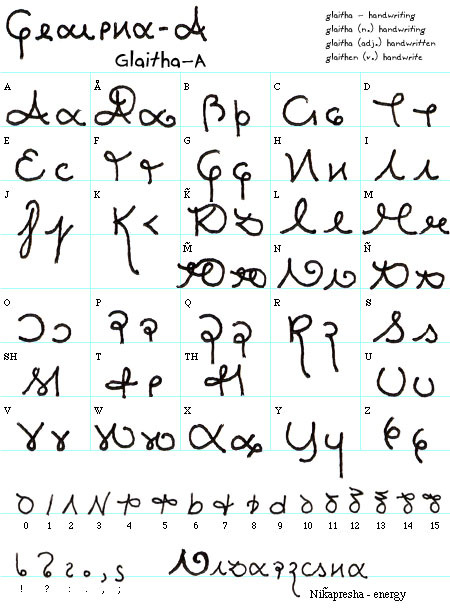 The original script used in the nation of Mika is called Glaitha-A (glaitha is the Mikianan word for writing). The fonts Constructium and Fairfax support Glaitha-A. There is also a font specifically for Glaitha-A, Terri Pro. Glaitha-A is registered in the Under-ConScript Unicode Registry (UCSUR) in the range U+E900-U+E97F. Here is the proposal. The fairies at the Mika City School for the Supernaturally Gifted use a different script called Glaitha-B, sometimes called Mikianan Fairy Script. Glaitha-B uses a combination base-5, base-20, and base-100 number system. A single "digit" can represent any value from zero to 99. The fonts Constructium and Fairfax support Glaitha-B. There is also a font specifically for Glaitha-B, Rebecca. Glaitha-B is registered in the UCSUR in the range U+E980-U+E9DF. Here is the proposal.